Medical practices are under increasing pressure to scan their medical files and convert them to electronic medical records (EMRs), making paper files a thing of the past. However, despite nearly $17 billion in economic stimulus money that is dedicated to medical records scanning, many small practices are still reluctant to make the change. 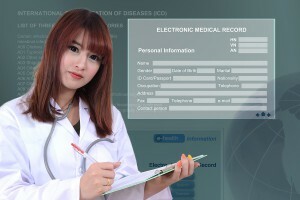 One of the biggest concerns about switching to electronic medical records is that you will lose contact with the patient. While the doctor acknowledges the benefits to all of the patient data being available on screen, they are worried about the distraction the screen may cause. However, with effective implementation this video shows just how an EMR/EHR system can improve day to day functions in your medical practice without hindering the quality of relationships a doctor has with patients. We offer a full-service experience to help you manage your documents. Let a professional, secure company and staff take the hassle out of your records scanning project. We’ll help you find the document scanning service that works for your business, and then help you through every step of the process. From organizing your files to be scanned to choosing the right electronic document management system for your business. Let us guide you through the process to the right solution. Record Nations has the manpower to quickly perform the indexing, scanning, and post production work, which includes conversion to text via optical character recognition (OCR) software. This allows you to edit the documents, or even redact private information to protect your patients or clients. Get a Free No-Hassle Quote on Document Scanning Today! To get started, fill out the form to the right, or give us a call at (866) 385-3706. We’ll get back to you as quickly as we can.